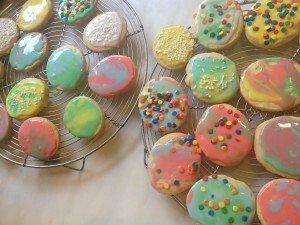 Picture #1: Easter cookies, 2012. Picture #2: Easter cookies, 2013. Okay, I personally don’t see a great leap forward in my family’s decorating skills. However, the awesome pastel cuteness of Pict #2’s cookies as captured by an iPhone 4s makes the previous year’s look like something from a horror movie. Please know that regardless of how photogenic they are, these cookies taste fantastic. We make them every holiday, decorate them (badly) according to whatever the occasion is, and eat them all very quickly. 2. Using an electric hand mixer, cream together the butter and sugar until they’re well blended. Mix in the vanilla. 3. In a separate bowl, mix together the flour and the salt. Add this to the butter and sugar mixture and blend well. 4. Roll out the dough between two sheets of wax paper, to about 1/4-inch thickness. Stick it in the fridge for a half an hour, then cut it into shapes, using cookie cutters (or an inverted juice glass). Bake them on an ungreased baking sheet for 20 minutes, or until they’re just turning golden. Let them cool for five minutes, then gently move them to a rack to cool completely. 5. To ice them, mix together the egg white and the sugar (and a drop of food coloring if you want), and spread the icing on the cookies. 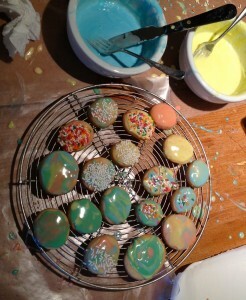 Add sprinkles if you like, and then set the cookies aside until the icing sets, about twenty to thirty minutes. 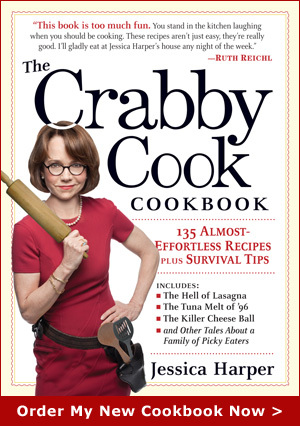 This entry was posted on Wednesday, March 27th, 2013 at 4:07 pm	and is filed under Holidays. You can follow any responses to this entry through the RSS 2.0 feed. You can leave a response, or trackback from your own site. Some have a pleasant tie-dye/ marbled look to them, though that’s not usually noticed when they’re being crammed into one’s face. Wow, nice shot! Who was your food stylist? Anyone I might know? Hah! yes, it was …! These sound great, and I love the colors. They look kind of tie-dye. I’ll try and make these next week!